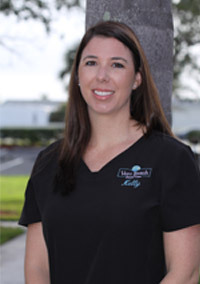 Kelly joined our family at Vero Beach Dental Care in January 2018. She grew up in Jensen Beach, Florida and earned her Dental Hygiene degree from Indian River State College. Kelly is a member of the IRSC Dental Advisory Board and loves volunteering at her Alma mater. She earned her Bachelor's degree from St. Petersburg Collge and most recently her Master's degree from the University of Tennessee in 2017. Kelly is a caring person that strives to make her patients comfortable and ensure that they have an enjoyable dental visit! She is very passionate about helping people understand the importance of their oral health. In her spare time, she enjoys spending time with her husband, boating and traveling.